The International Alumni Association Board (IAAB) bestowed the 2018 Distinguished Alumni Award to Virginia R. Wiltse, Ph.D. (2000) at the Homecoming celebration on October 5, 2018. 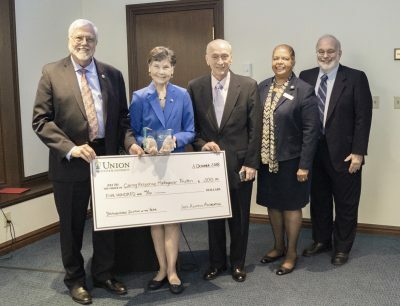 Dr. Virginia Wiltse is a most deserving recipient of this award, having distinguished herself and Union Institute & University through her generous and selfless service and visionary leadership of a variety of organizations and agencies, both in the U.S. and abroad. A member of Union Institute & University’s Board of Trustees from 2006 to 2015 (and chair from 2012-2014), she also served with the SC Ministry Foundation Board of Trustees, Seton High School Board of Trustees, the Children’s Heart Association Board of Trustees, the Association of Enneagram Teachers in the Narrative Tradition, the Order of Malta, and St. Xavier Parish, Cincinnati. She has received numerous awards, including: Exemplar Award from the Notre Dame Club of Cincinnati with son David; Bene Merenti Medal for service to the Church and poor of Madagascar; numerous citations of appreciation from Government of Madagascar, Ministries of Health and Education; Bayley Diamond Tribute Award with husband Dave Wiltse, M.D. ; Mother Seton Award for service to the Sisters of Charity of Cincinnati; and Cincinnati Enquirer Woman of the Year honoree. It is her work both for Union and for Caring Response Madagascar Foundation that singled her out as the recipient of the award. Dr. Wiltse, among her other major achievements, has been instrumental in securing two major gifts – among the largest in the university’s history – to support graduate students: the Virginia Ruehlmann Women in Union Scholarship grant from the Helen Steiner Rice Fund of the Greater Cincinnati Foundation, created to honor Dr. Wiltse’s mother; and the Eugene P. Ruehlmann Fellowship for Public Service, funded by the Western & Southern Financial Fund, created to honor and further the contributions of Dr. Wiltse’s father, longtime Cincinnati mayor, Eugene P. Ruehlmann. Dr. Wiltse directs the operations and fundraises for Caring Response Madagascar, the charity founded by her son, David Wiltse. As vice-chair, she engages volunteers, including medical and nursing staff, to impact not only education and literacy for the unschooled and inadequately schooled, but also to help with environmental issues, disasters, healthcare, literacy, economic self-development, nutrition, sanitation, and saving the lives of mothers and babies. Since 2002, more than 122,000 adults have completed the CRMF literacy program. In 2006, CRMF funded the regions’ first computer training center, where 5,000 young adults have completed technology-training programs. Through her visionary and selfless leadership and hands-on implementation, Dr. Wiltse is breathing life into Union’s vision to transform lives and communities, and exemplifying her alma mater’s mission by inspiring others to become engaged, enlightened, and empowered to lead a life of learning, service, and social responsibility. Discover how a degree from Union can transform your life and community!